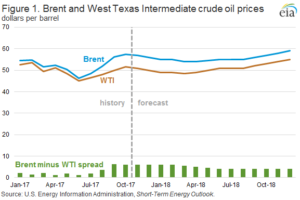 In its November Short-Term Energy Outlook (STEO), the U.S. Energy Information Administration (EIA) forecasts the price difference between West Texas Intermediate (WTI) crude oil priced at Cushing, Oklahoma and Brent, the global crude oil price benchmark, to remain at $6 per barrel (b) through the first quarter of 2018 before narrowing to $4/b during the second half of 2018 (Figure 1). WTI averaged $2/b lower than Brent price through the first eight months of 2017 and averaged $6/b lower than the Brent price in September and October. The forecast Brent-WTI price spread in the November STEO is about $1/b wider than was forecast in last month’s STEO. 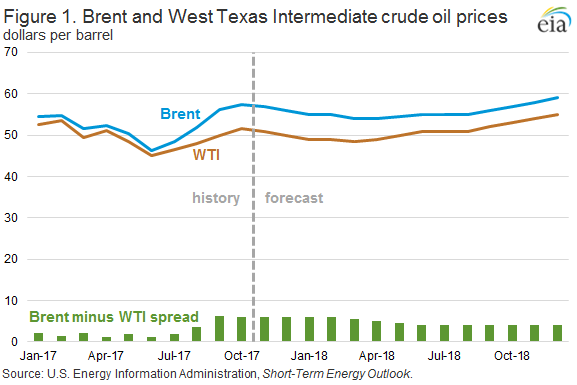 The wider forecast spread reflects continuing price developments that have emerged over the past two months that likely resulted from transportation constraints in moving domestically produced crude oil from Cushing and from the Permian basin in Texas to the U.S. Gulf Coast. Although many other factors can affect WTI, Brent, or both crude oil prices at any given time, near-term changes in the Brent-WTI price spread will generally come from pipeline capacity expansions and increasing U.S. crude oil production moving in and out of balance. The WTI price spread with Brent reflects the transportation costs associated with bringing crude oil from Cushing to the U.S. Gulf Coast and with exporting crude oil to Asia, the marginal market in which Brent and WTI crude oils compete. As U.S. crude oil production has increased, particularly in regions like the Permian basin, so has the need for more transportation infrastructure to accommodate it. However, the rate of production growth and the scale and timing of when additional pipeline capacity will be brought online are not always aligned. EIA estimates that, without pipeline constraints, moving crude oil from Cushing to the U.S. Gulf Coast typically costs $3.50/b, but it has gotten more expensive as transportation constraints have developed. The transportation constraints between inland domestic crude oil production and the Gulf Coast have resulted in relatively high levels of crude oil inventories in Cushing, within Petroleum Administration for Defense District (PADD) 2. Total commercial U.S. crude oil inventories declined by 25 million barrels from the last week of July to the week ending November 3, but inventories in Cushing increased by 8.8 million barrels. 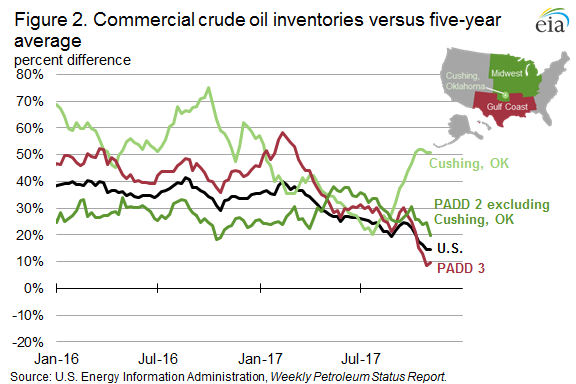 The inventory builds at Cushing have pushed its inventories 51% higher than the five-year average, while U.S. and U.S. Gulf Coast (PADD 3) total crude oil inventories are only 15% and 10% higher than their respective five-year averages (Figure 2). The remainder of the Brent-WTI spread is associated with transporting light sweet crude oil from the U.S. Gulf Coast to Asia. With the removal of restrictions on exporting domestically produced crude oil in December 2015, additional supplies of light sweet crude oil that cannot be economically processed at refineries or transported domestically can now be exported. Once exported, WTI competes with Brent directly in the global market. U.S. crude oil export data suggest that the marginal competitive market for WTI and Brent is in Asia. So far in 2017, China is the second-largest destination for U.S. crude oil exports at 173,000 barrels per day (b/d). To compete with Brent in Asia, WTI prices must reflect the additional transportation costs U.S. crude oil exports incur on their way to Asia. Although more infrastructure to export crude oil has been built recently, U.S. exporters must still use smaller, less-economic vessels or complex shipping arrangements, which add to costs. EIA estimates that it costs approximately $0.50/b more to transport WTI from the United States to Asia than it costs to ship Brent from the North Sea to Asia. Many other factors may influence the Brent-WTI spread, although those factors are likely to fluctuate and average out over the course of many months. EIA forecasts the Brent-WTI spread will remain at $6/b until the second quarter of 2018, when increased transportation capacity between inland crude oil production and the Gulf Coast is brought online. These projects include the 0.4 million barrel per day (b/d) Midland-to-Sealy pipeline that will increase crude oil flows out of the Permian to the U.S. Gulf Coast when it becomes operational, currently planned for the second quarter of 2018. Other pipeline projects will increase Midwest refineries’ access to crude oils in the Permian region, potentially resulting in lower crude oil stocks at the Cushing pricing hub. Uncertainty associated with this element of the Brent-WTI spread forecast comes from potential changes in U.S. crude oil production growth rates and delays in pipeline completions. EIA expects that the additional transportation capacity between domestic crude oil production and the U.S. Gulf Coast will result in the Brent-WTI spread reverting to an underlying $4/b, based on estimated transportation costs and the costs of exporting to Asia. The U.S. average regular gasoline retail price increased 7 cents from the previous week to $2.56 per gallon on November 6, up 33 cents from the same time last year. The West Coast and Midwest prices each increased 12 cents to $3.05 per gallon and $2.55 per gallon, respectively, the East Coast and Gulf Coast prices each increased 3 cents per gallon to $2.48 per gallon and $2.25 per gallon, respectively, and the Rocky Mountain price increased 2 cents to $2.54 per gallon. The U.S. average diesel fuel price increased 6 cents to $2.88 per gallon on November 6, 41 cents higher than a year ago. The West Coast price increased 22 cents to $3.33 per gallon, the Midwest price increased 5 cents to $2.86 per gallon, the East Coast price increased 4 cents to $2.85 per gallon, the Gulf Coast price increased 3 cents to $2.67 per gallon, and the Rocky Mountain price increased 2 cents to $2.97 per gallon.